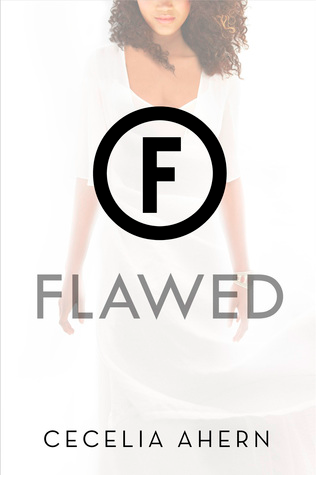 Summary: In this society, flaws have not only been eliminated, but they've essentially been made illegal: individuals who lie, who make bad decisions, who dare to rebel, etc., are declared Flawed and branded according to their Flaw. Celestine, on the verge of turning eighteen, is living the perfect life: she has a loving family, she gets good grades, and she's dating an amazing guy (who happens to be the son of Judge Crevan, the head person responsible for doling out justice to the Flawed). However, after one terrible mistake, Celestine is thrown into a maelstrom, and she no longer knows whom to trust. People either want a piece of her, to use her for their cause, or they want to see her in pieces. All she knows is that more people are questioning the system than ever before, and that she is at the center of it. Thoughts: Before I started this, I peeked at a number of reviews on Goodreads, and they were all over the place, which made me hesitate a little bit. But I loved Love, Rosie, and was willing to give it a shot, even though the official summary didn't really sell me on the premise. I ended up being really fascinated by the premise, even more than the main character. In fact, it was hard for me to get into the story at first because Celestine didn't inspire much feeling in me. The implications of their societal rules didn't really sink in until the action picked up, and suddenly, I was intrigued at the ramifications. Especially as a teacher, I care a lot about living in a compassionate society, and the fact that the Flawed are so shunned in their society that the general public treats them with contempt, even to the point of just letting them die, really caught my attention, because of course, I would think that a lack of compassion is a flaw. So THEN I was hooked. As things got worse for Celestine and more of the inner workings and rules (written and unwritten) of their society were revealed, I found myself drawn in even further. I really want to know what happens not just to Celestine but to their society as a whole, because it's clear that their system is so full of flaws and corruption that it just will not hold. I gave this book 3 stars, but they're very enthusiastic stars - I liked this book, and I'm expecting that this series will get better as it goes along. I can't wait to read more. I want to see where Ahern ends up taking this, and I will definitely be on the lookout for the next book.